Who can forget iconic moments like carrying a watermelon to 'nobody puts Baby in a corner' and that lift? This stage show based on the famous film is here to bring all of those to life. I caught the show in Birmingham at The Alexandra and it's very much aimed at fans of the film as it follows the storyline and dance routines almost exactly - with a few extra storyline elements. There's all the music too - all 35 of the hit songs from 'Hungry Eyes' to 'Do You Love Me?' and, of course, '(I've Had) The Time of my Life'. At 2h 15 min, the show skips along brightly with live singers and a band on stage that add to the atmosphere. I saw this show several years ago when it seemed a bit stilted but this new production has more zest and seems slicker. For those of you who aren't aware of the story, it is set in early 1960's America when families went to quaint summer camps together to take part in talent competitions, group dance classes and the like. This is where we find feisty Frances 'Baby' Houseman, whose on holiday with her boring middle-class family and goes off to find something a little less vanilla in the shape of hunky dancer extraordinaire Johnny and his pulsating, risqué dance moves and biceps. It's hard to fill the shoes of the film's two main stars, particularly Patrick Swayze, but Michael O'Reilly and Kira Malou do a good job of fitting into the brief. Actress Kira Malou is styled to look like Jennifer Grey with short curly hair and O'Reilly seems to do a good job of pleasing the mainly female audience judging by the whoops and cheers, particularly when he moves, or strips, or dances... or breathes. It's a raunchy show with some adult themes including abortion and even a gratuitous bum shot as Johnny gets out of bed (more whoops of delight). It does have an age guidance of 12 though. Added to the film script is a new thread about the civil rights movement with guests listening to a Martin Luther King speech around the campfire and the hotel owner's son planning to go on a march to support the drugstore sit-ins in the Deep South, to support equal rights. It fits in well with the storyline of Baby being someone who wants to change the world. This version also realises its limitations against the film and cleverly makes light of the river scene when they practise their lifts in the water. A huge screen projects the water and the pair appear comically behind it as though coming out of the water. It's refreshing and fun. Alongside the leads, Simone Covele as Penny stands out as a first class dancer while Lizzie Ottley shows some great subtle comic acting as Baby's sister Lisa. 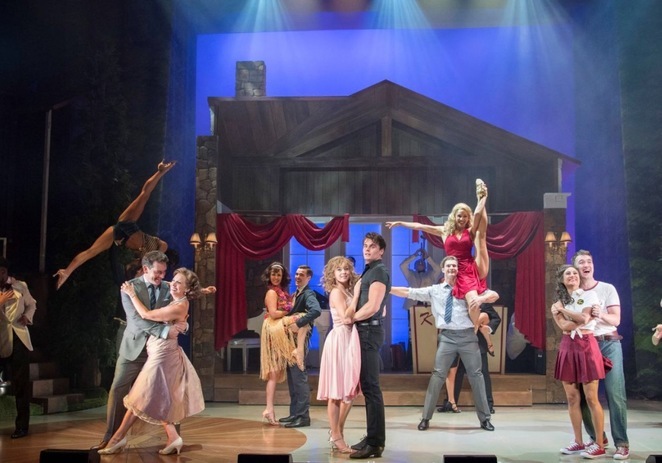 Ultimately, Dirty Dancing - The Classic Story On Stage provides the audience with what it says on the tin. It's a live version of the movie, overflowing with feel-good, romantic and sizzling moments. Added to that is the well-loved music that the audience is itching to sing along to. By the finale and the moment when Johnny tells us 'no one puts Baby in a corner', the screams ringing around the auditorium have the feel of a massive hen's night. With plenty of saucy dance routines, all those famous iconic lines and some well-cast talent on stage, Dirty Dancing fans will have the time of their lives at this fun feel-good piece of escapism.